Egyptian President Hosni Mubarak and visiting Chinese Prime Minister Wen Jiabao on Sunday discussed ways for the two countries to boost economic and trade relations. The meeting came a day after Wen and his Egyptian counterpart, Ahmed Nazif, signed 10 agreements on oil and natural gas, telecommunications and the resumption of Egyptian citrus exports. China also agreed to give Egypt a US$50 million loan and a US$10 million grant to build an investment headquarters in an industrial area northwest of the Gulf of Suez. In Sunday's meeting, Wen told Mubarak China was ready to increase investment in Egypt, especially in oil, natural gas and telecommunications industries, said presidential spokesman Suleiman Awwad. Mubarak assured Wen of Egypt's policy of recognizing one China, Awwad said. The two also discussed the Israeli-Palestinian peace process and the situation on the Korean Peninsula, he said. Trade between Egypt and China topped US$2 billion in 2005, an increase of 36 percent over the previous year. 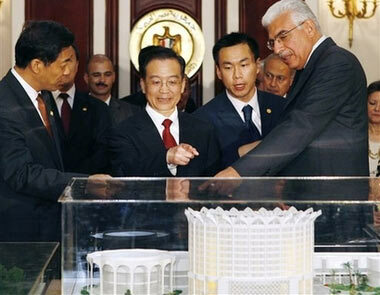 China has 186 projects in Egypt, with a total investment of US$220 million. Wen and Nazif attended celebrations Saturday night at the Great Pyramids to mark the 50th anniversary of the establishment of diplomatic relations between the two countries. In 1956, Egyptian President Gamal Abdel Nasser recognized China, making Egypt the first Arab or African nation to do so, in defiance of US efforts to discourage other countries from dealing with the country. The United States established diplomatic ties with China after 29 years on January 1, 1979. After Wen's two-day visit to Egypt, he was scheduled to continue on to Ghana, Congo, Angola, South Africa, Tanzania and Uganda. .